For my first catch-up dinner with my bestie last Sunday, he suggested Ju Ge Mu & Shimbashi , a Japanese restaurant at Neutral Bay less than 15 minutes drive away from my home. The normally busy Military Road was surprisingly quiet and devoid of traffic, which made parking a breeze and we got the prized parking spot right in front of the restaurant. 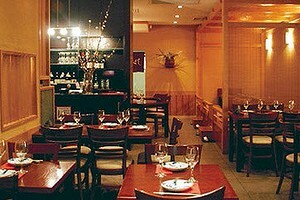 Ju Ge Mu & Shimbashi is an interesting hyphenated name for a restaurant, so I did a quick search on the net. Apparently in Japan, restaurateurs concentrate on specialising, rather than offering a meal-for-all-seasons. Hence, Ju Ge Mu & Shimbashi wanting to give the best of both worlds in soba and teppanyaki successfully combined two specialty restaurants under one roof in a comfortable Japanese ambience. Ju Ge Mu, the teppanyaki side, has dark timbers, red walls and a teppanyaki bar at the back where you can watch the action. Shimbashi is the yellow soba side with a soba making machine in front of the restaurant, and a traditional Japanese sitting area. 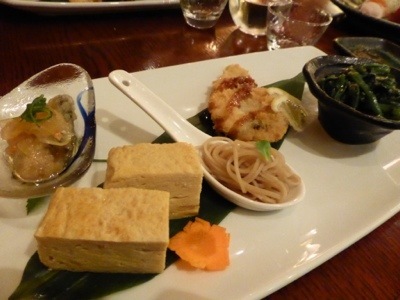 We ordered the 3-course set dinner ($50), but upgraded our soba option by paying $7 extra. There are 3 options for the main and soba courses. There is also a Duck Hot Pot Winter special for 2 people for $42 which seems reasonable. 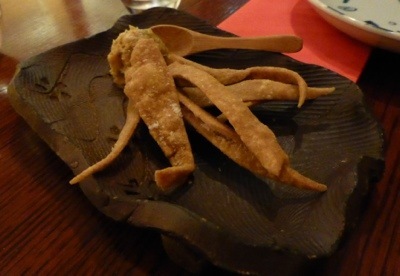 We had a complimentary starter of fried soba chips and Japanese guacamole made from avocado, sashimi and fish roe. The thick soba chips needed some jaw action but the flavoursome creamy guacamole with a spicy kick made up for the effort. My friend who is also a photographer had suggested me to buy the Lumix TZ40, and since I could not get the wifi to function on my camera even after consulting the instruction booklet, he had to show me how. QED (Quite Easily Done) – aka the instruction manual was poorly written. 🙂 We then compared notes, he took some pictures with his Lumix GF6, his pictures are slightly darker than mine,but otherwise pretty similar. Kudos to him for understanding my needs and good recommendation – I prefer my lighter Lumix with a wifi function over his GF6. Next to arrive was my main for my set dinner which also came as our appetiser. 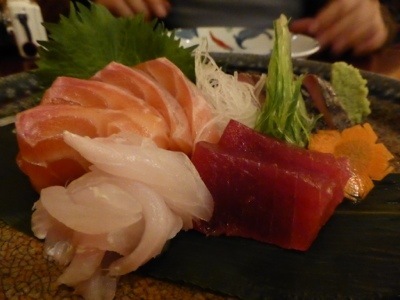 The assorted sashimi was the finest I’ve had for a long time, very fresh and served at the right temperature. I especially like the thick salmon sashimi which went very well with the hand grated wasabi. I won’t mind coming here solely for the assorted sashimi platter the next time around. Then my friend’s main course of grilled fish followed. Tender, juicy and smelling buttery, it was perfectly grilled with flaking meat. 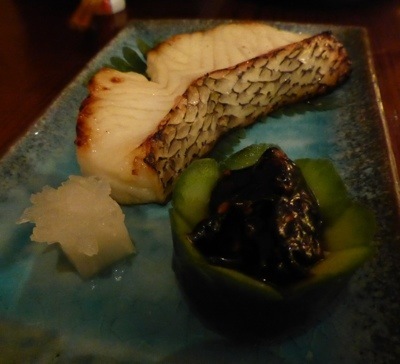 The buckwheat in miso sauce presented in a hollowed out cucumber added extra umami to the fish. 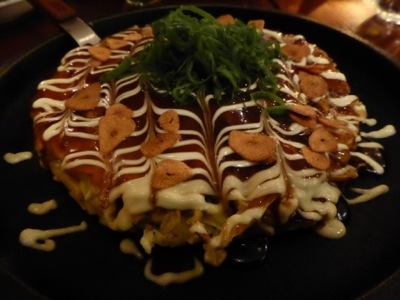 While busy attacking the fish, our Okonomiyaki of Wagyu beef and garlic chips made its appearance. It came on a metal plate, beautifully decorated with soy and mayo sauces. I normally scrap all dressing off my foods, but I made an exception for this one and added extra bonito and seaweed flakes that came in a tin that accompanied the okonomiyaki. In any regards, the pan-cake was too doughy and thick for me. I would prefer a slightly thinner and crispier pancake instead. My final course was the Soba Course. I ordered the Walnut Soba (hot). I am very happy with my choice as I had never came across walnut broth before. The broth was a thick savoury soup made from grounded walnut, with the natural nutty sweetness. 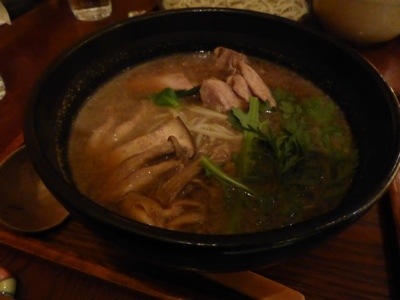 There are also 2 types of mushrooms and chicken pieces to’ lift’ the soup. 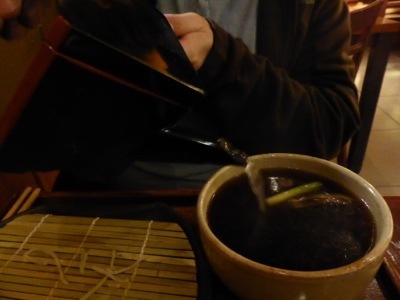 The thin soba was firm with grainy texture. We were well looked after by the part-time staffs who introduced each dish to us as they arrived and made sure our drinking glass is never empty. Ju Ge Mu & Shimbashi is truly a neighbourhood restaurant since we were nearly the last table by 8pm. 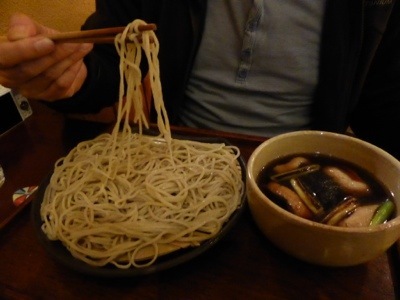 With perfectly handmade soba noodles, it deserves many revisits! 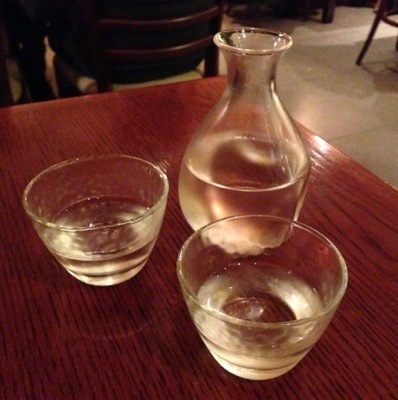 At the time of review Ju Ge Mu & Shimbashi scored 91% out of 245 votes in Urbanspoon. This entry was posted in Japanese, Sydney, Uncategorized and tagged 3-course set dinner, Cremorne, Duck, Duck Broth, Handmade Soba, Japanese, Lower North Shore, Lumix TZ40, Okonomiyaki, Sake, Sashimi, Soba, Soba chips, Sobayu, teppanyaki, Walnut Soba. Bookmark the permalink.